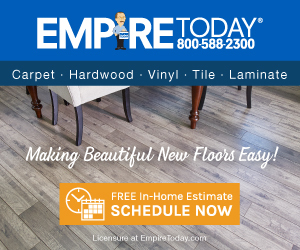 I purchased floors from Empire Today. I paid almost four grand. First the sales rep lied and said it would be done in one day and the quality of the floor was great. That it would not buckle scratch or warp. Well first of all, it took four days to do. It was the workers first job, he had no help or supervision. The floor should of been installed better than it was. But I didnt complain about any of that cause I have five kids, who all had to stay in a basement for four days. One child had to have physical therapy at the house so I didnt have time for them to come and redo it all. I just dealt with the way it was. The floor began to warp buckle and scrath. I tried contacting the company on several occasions and I was told someone would email or call me in one to three days. After several times of no responses, I call tried to call back and both numbers I had were disconnected. I am furious at the customer service I have recveived. I spent alot of money and felt as if I was lied to about everything. I feel like they are a scam when it come to the warranty because they give you the run around. I still havent heard from them yet. If I dont, I am contacting my lawyer and the Better Business Burea. Do not get anything done by Empire Today. They are a joke!! Review #159313 is a subjective opinion of User159313. Thank you for bringing your flooring experience to our attention. We apologize for any inconvenience, and our customer service team would like to work with you to explore a resolution. Please contact us at 800-588-2300 so we can assist you.